Chicago, 2055. Charles Hatton has created Time Safari Inc, which offers paying customers the opportunity to travel back through a portal into the prehistoric past to hunt dinosaurs. The Temporal Regulation Division has been set up to carefully monitor the safaris and make sure that nothing in the past is changed lest it affect the future – the hunters can only kill dinosaurs that are about to die and cannot touch, leave behind or take anything from the past. Hatton’s guide, biologist Travis Ryer, is drawn to Sonia Rand, Hatton’s former computer systems designer, after she breaks in to protest at the potential disasters inherent in what they are doing. After returning from one safari, they discover that they have managed to somehow change the past. The present soon becomes affected by increasingly more severe timewaves that cause an alternate timeline to start occluding this one – one where evolved plant growth and dinosaur-primate half-breeds run rampant. It is up to Travis and Sonia to race through the increasingly devolving world to find the source of the original disruption to the timeline – one of the hunters having stood on a butterfly – and for Travis to then return to the past before the incident occurred and prevent it from happening. A Sound of Thunder (1952) is a classic science-fiction short story from Ray Bradbury. The late Ray Bradbury was known for novels such as The Martian Chronicles (1950), The Illustrated Man (1951), Fahrenheit 451 (1953) and Something Wicked This Way Comes (1962) to name but the most famous and was one of the few genre writers to become acclaimed by mainstream audiences. There have been numerous film adaptations of Bradbury’s works – a list of which can be found at the bottom of the page. Bradbury wrote A Sound of Thunder as a classic demonstration in the problems of time travel. 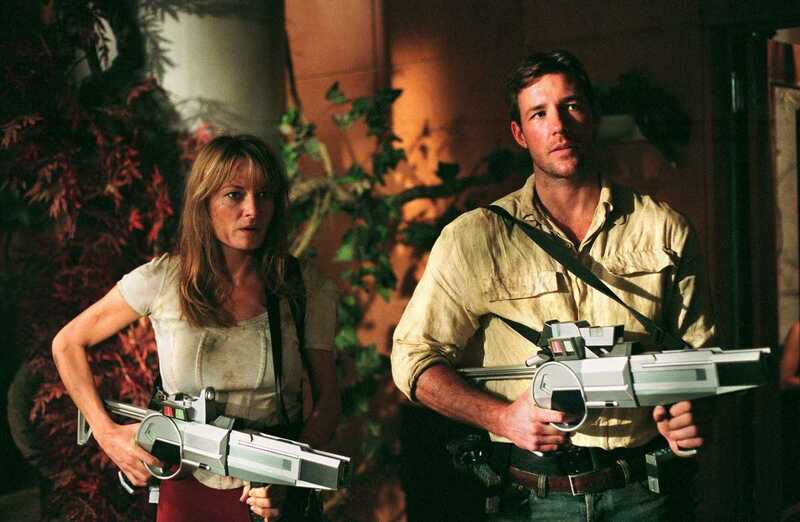 In the story, we join a hunter and group of tourists who travel back through a time portal to hunt dinosaurs. Because of the potential problems that can occur in changing the past, they can only kill dinosaurs that are about to die and cannot touch or alter anything in the past. It is then found that one panicked hunter stepped on a prehistoric butterfly. Upon returning to the future, the time travellers discover that the present is ruled by a dictator and that English is now spelt differently. The story ends at this point. The story was later adapted into an episode of tv anthology series The Ray Bradbury Theater (1986-92). One of the more interesting cultural influences that A Sound of Thunder had was is in giving its name to the so-called Butterfly Effect in chaos theory where a random event (such as killing a butterfly or it flapping its wings over Tokyo) can have vast unforeseen effects elsewhere in a complex chaotic system. 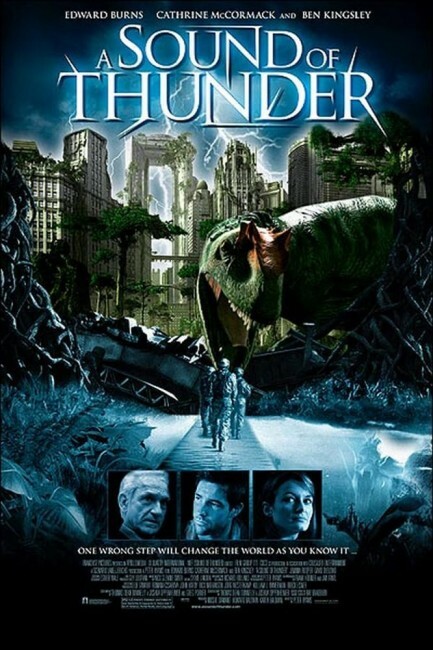 A Sound of Thunder is a big-budget film based on the Ray Bradbury short story. Well before its release, A Sound of Thunder had the death knell of a disaster in the making. The film was originally to start shooting in Montreal in 2001 under director Renny Harlin, of Die Hard 2 (1990) and Exorcist: The Beginning (2004) fame, and starring Pierce Brosnan but ended up being delayed. Harlin was later replaced by veteran genre director Peter Hyams (see below for Peter Hyams’s other genre credits). Hyams’ version of the film started production without financing entirely in place. One of the film’s major producing partners, QI Quality International GmbH & Co. KG, financially collapsed part way through production. 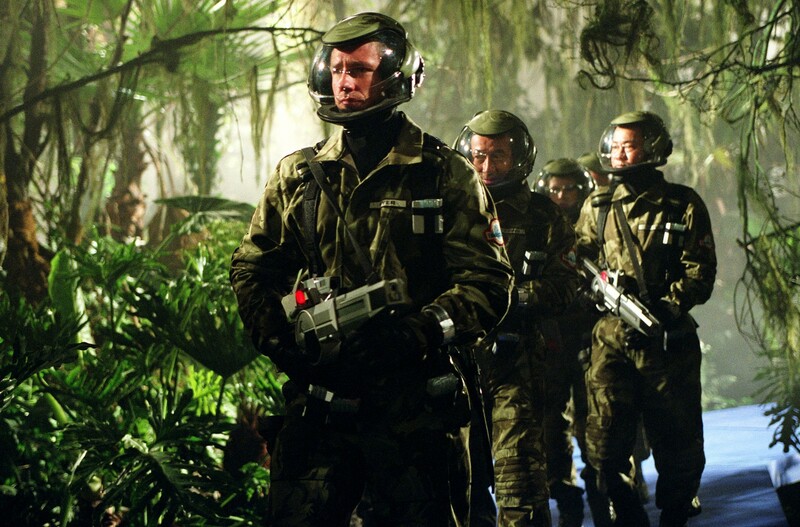 Bolstered up by a host of other international production companies, the film ended was shot in the Czech Republic in 2002, only to then be struck by massive flooding that wiped away several of the sets. Even more ignominiously, when finally released after more than a year’s worth of delayed release dates, A Sound of Thunder earned only a pitiful $1.1 million in its opening week (despite having a $52 million budget) and received reviews that ridiculed it to high heaven. In most countries, the film sidestepped any theatrical release and went directly to videostores. The big question when finally sitting down to watch A Sound of Thunder is is it the disaster that everything about the film would seem to indicate it is? The answer is a resounding yes. One gets a sinking feeling from the opening title cards where we are informed: “In the year 2055. A new technology was invented that could change the world … Or destroy it. A man named Charles Hatton used it to make money.” With this kind of tired harbinger headline ringing, one realises even before the film has begun that Ray Bradbury’s theme – which was merely a demonstration in the unforeseen problems of causing change in the past – has been upstaged by lurid Luddhite warnings and the addition of the cliche greedy capitalist who is earmarked as a villain from the moment he appears. Ray Bradbury’s story runs to less than 3000 words and had a slim succinctness; the film makes the mistake common to many feature-length expansions of short material – it overburdens the story in a way that no longer makes sense. In building the story out, the film is required to explain far more about how this future works to the point that the original concept ends up looking ungainly. In adding the character of Ben Kingsley’s Hatton as a greedy industrialist, it is hard to believe, for instance, that people would come up with a discovery as wide-ranging as time travel and that all that someone would do with it is to create dinosaur hunts. Ray Bradbury has not had a happy history of being adapted to the screen – disasters like The Illustrated Man (1969) and The Martian Chronicles (1980) – and A Sound of Thunder can quickly be placed atop the junk pile. There are parts of the film that are ridiculously written. The Heisenberg Uncertainty Principle is invoked to mean that you cannot have “zero tolerance” in a system, that accidents do happen. All that the Heisenberg Uncertainty Principle states is that it is impossible to know the velocity and position of a moving sub-atomic particle at the same time; here it is transformed into something akin to chaos theory, the same way that chaos theory was used in Jurassic Park (1993) as a justification for Murphy’s Law, that if there are unpredictable elements in a system they will inevitably cause everything to go wrong. (In fact, the more one thinks about it, the more one realises that Michael Crichton must have substantially borrowed from the A Sound of Thunder short story when he wrote Jurassic Park – A Sound of Thunder led to the notion of the Butterfly Effect, and Jurassic Park and its dinosaurs are largely an illustration of chaos theory in action). There are logical holes to the film as well. It seems that (because of cheaply recycled special effects scenes) the hunters are travelling back through time to hunt the same dinosaur – but surely if that were the case we would see multiple hunting parties all arriving at the same moment and trying to kill the same dinosaur. The most absurd notions come with the ideas of the ‘timewaves’ where the changes affected in the past seem to occur in increasingly more severe waves. This is a piece of nonsense invented solely to give the middle of the film dramatic tension as the heroes race across a city having to deal with prehistoric menaces gone out of control (an aspect that does not exist in the Ray Bradbury short story). In actuality, making a causal change in the past would be like adding a new pathway in the timeline – everything that happens from that point on would travel in a different direction and the familiar present would no longer exist. People’s memories would be different, some people would not be born and history would happen differently; what causality is not like is a rubber band that ripples when tweaked. I found it a difficult stretch to believe the causal dilemma in Bradbury’s original story – the wider one would get from the original event, the more widespread the changes would become. It is difficult to believe that one change 64 million years ago would still have paralleled the present so much that the same dictator would have been born and the only difference being that he is now in power. This entails the alternate present mirroring the other one so much so that everything transpires near identically right up until the present. In a way, the film’s changes are far more credible because they are likely alternate paths from a prehistoric change – vast sweeping evolutionary changes to lifeforms and the ecosphere. On the other hand, one finds it a little hard to understand how the death of a single butterfly can cause an entire new evolutionary chain to manifest. (Peter Hyams’s Timecop (1994) is a film that creates a far more logical and internally coherent story about the changes in causal effect). The most absurd part of the film is the notion of creatures that have evolved as half apes, half-dinosaurs – “It’s reptilian with a bit of primate thrown in,” one character says. Aside from the basic biological absurdity of the idea, which is something that even somebody in a high school biology class would know enough about to laugh at, the sight of seeing creatures that alternate between apes and dinosaurs like some kind of changing trompe l’oeil effect looks incredibly ridiculous on screen. The film is something that only barely touches base with Ray Bradbury’s short story. Bradbury’s story with its dark ending was a neat, succinct demonstration of the dangers of causal accidents; the film however embellishes it out into an sf/action film about people being hunted through a devolving present by ape/dinosaur hybrids and other evolutionary monstrosities and where the original twist ending is supplanted by a new upbeat one where the hero must go back in time and prevent the butterfly from being crushed. The special effects are decidedly on the cut-price side. They have a routine competence but the scenes of the futuristic streets of Chicago with vehicles busily buzzing in the background leaves one never less than certain that the actors are merely standing in front of a blank screen and that the vehicles and street backdrop have been digitally inserted. As mentioned above, the film even cheaply recycles the same CGI sequence with the dinosaur charging the tourists twice over. A fine and celebrated actor like Ben Kingsley is clearly only in the film for the paycheque and gives a performance where he plays broadly to the gallery. None of the other performances hold any worth – when it comes to the character of William Armstrong’s Eckles, his fear and nervousness is overstressed to the point of hitting us over the head with a blunt instrument. Peter Hyams is a multi-disciplined director with a veteran genre background. In the 1980s, Hyams made a trio of fine science-fiction films with the faked Mars landing film Capricorn One (1978), Outland (1981) set on one of Jupiter’s Moon, and then the 2001: A Space Odyssey (1968) sequel 2010 (1984), his single best film to date. He also produced the quirkily appealing Universal monster homage The Monster Squad (1987). For several years, Hyams fell silent within the genre, directing action thrillers like Running Scared (1986), The Presidio (1988) and Narrow Margin (1990). He made a return to genre material in the 1990s with films like Stay Tuned (1992), Timecop (1994), The Relic (1997) and End of Days (1999), interspersing these with action films like Sudden Death (1995) and The Musketeer (2001). While Hyams’ science-fiction films of the 1980s marked him as a promising talent, his work throughout the 1990s has been disappointing to see – indifferent hackwork where Hyams seems to lack any creative interest in the work and is present as nothing other than a hired gun director. Here Hyams engages in some cutely self-referential asides. Ben Kingsley has a line: “Today you stand shoulder to shoulder with Columbus discovering America, Armstrong landing on The Moon, Brubaker discovering Mars” – in Hyams’s film Capricorn One, about a faked Mars landing, the team commander played by James Brolin was a Colonel Brubaker. Later in the ruins of the Chicago, we see a Spota’s Market – with Spota being the name of the assassin hunting Sean Connery in Outland. Other Ray Bradbury screen adaptations include:– the classic atomic monster movie The Beast from 20,000 Fathoms (1953) from Bradbury’s short story The Foghorn (1951); the alien invader classic It Came from Outer Space (1953) from his original screenplay; Francois Truffaut’s adaptation of Fahrenheit 451 (1966); the anthology The Illustrated Man (1969); the tv mini-series The Martian Chronicles (1980) from his classic book; the tv movie The Electric Grandmother (1980); the screenplay for the fine Something Wicked This Way Comes (1983) from his own novel; his screenplay for the animated adaptation of the classic comic-strip Little Nemo: Adventures in Slumberland (1989); the tv anthology series The Ray Bradbury Theater (1986-92) where Bradbury adapted his own stories and hosted the series; the screenplay for the animated children’s film The Halloween Tree (1993); Stuart Gordon’s adaptation of The Wonderful Ice Cream Suit (1998) about a seemingly magical suit; Chrysalis (2008); and the tv movie remake of Fahrenheit 451 (2018).